At a time when so called Christian countries are aggressively getting rid of traces of their Christian origins and its well-known gospel preachers failing to stand by the truth or speak boldly before the media, believers in countries like China, India and Arabia have been more bold to profess their beliefs in Christ and stand by what Bible says. 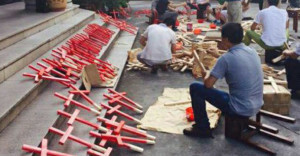 Recently, the Chinese government carried out a major crosses demolition drive that removed several crosses from various churches. The Chinese government had also authorized and instructed the police to arrest any Christian who opposes the demolition. This drive is still active. Early this year, Christian Pastor Huang Yizi from Pingyang county was sentenced to one year imprisonment because he opposed the removal of the Cross from top of a Church. Next story Why did Muhammad Ali convert to Islam?